Bullish homing pigeon - diminishing selling power, possible trend reversal? 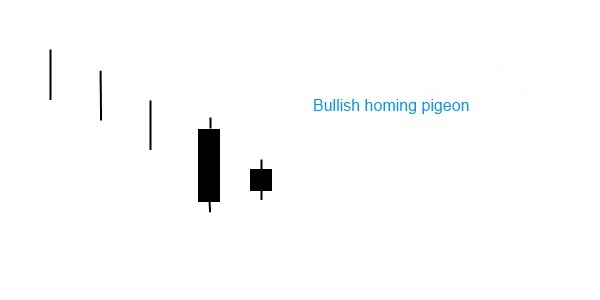 Bullish homing pigeon is a two-line candlestick pattern that appears in a downtrend. Both of the elements are black candlesticks, the first one should be much larger than the second. Actually the latter should be completely engulfed by the body of the first candle. What happens if a bullish homing pigeon forms? The bullish homing pigeon pattern is an indication of a weakening downtrend. It is easy to recognize and understand. In a market characterized by a downtrend, there is heavy selling reflected by the long, black real body of the first day. The small body of the second day shows diminished power and enthusiasm of the sellers thus suggesting a trend reversal. It is similar to the bullish harami pattern, except that both bodies are black. This signal reflects disparity on the market, it is the bullish counterpart of the descending hawk.